Capcom says in its 2013 annual report that it expects the packaged game business will shrink by a whopping $5.3 billion in 2017. I hope this doesn't come as too much of a shock to anyone, but the conventional retail videogame business is struggling. The days of nipping over to your local retailer to browse the shelves and pick up the preorder you placed two months prior are rapidly drawing to a close; today's hip, connected gamers are far more likely to drop a few bucks on a Steam sale or the latest old-time release on GOG. It's a trend that has Capcom gearing up for big changes in the future. "Analyzing the consumer market by platform, we forecast severe contraction in the package market, which is expected to shrink by 5.3 billion dollars in 2017 (down 28.8 percent from 2012)," the company said in its 2013 year-end report. "At the same time, we forecast significant growth in the DLC market by 7.8 billion dollars (up 109.9 percent). Going forward we will allocate management resources to DLC within the consumer market to ensure sufficient earnings." The report states that DLC accounted for 27.8 percent of the consumer game market in 2012 but only 11.3 percent of Capcom's sales, "which were still heavily dependent on package sales, revealing the lateness of our response to the rise of DLC." It also notes problems with the company's strategy, announced in 2009, of relying more heavily on overseas developers. As a result, Capcom says it will move toward "migrating DLC development in-house and increasing its proportion within the consumer segment." "Migrating development in-house allows us to use our accumulated expertise to improve quality and strictly enforce schedules while creating a mechanism enabling development and marketing departments to respond to digital advances in an aim to increase the proportion of DLC and improve profitability," the report states. Capcom also noted that the increased emphasis on DLC will allow it "to realize long-term, stable additional sales by capturing users with the ongoing distribution of DLC... Specifically, we will (1) provide additional content strategically after the launch of major titles like Resident Evil and Street Fighter to lengthen the product lifetime and (2) expand download-only titles like Dungeons & Dragons: Chronicles of Mystara. 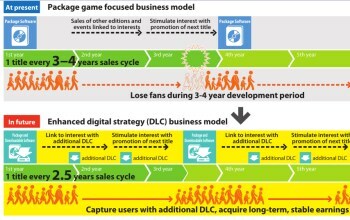 We will also establish a development and marketing structure to conform to the DLC business."